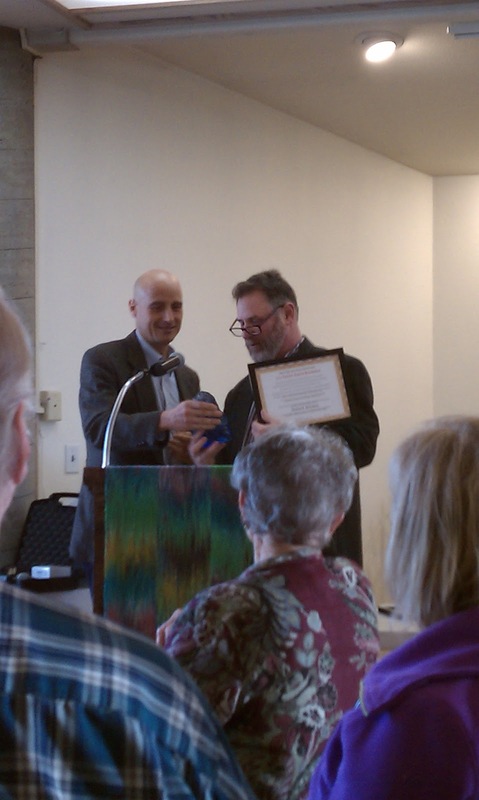 ARCATA -- Richard Salzman of Arcata was honored as the 2012 “Patriot of the Year” on Monday by the Redwood Chapter of the American Civil Liberties Union. Salzman was recognized for a range of political and civil causes, especially his successful lawsuit against the city of Arcata for its restrictions on free speech as contained in the city's panhandling ordinance. ”I believe in this American experiment in democracy, and was pleased that in this situation the system worked the way the founders intended -- with the court correcting the overreach of the legislative body, when a law they wrote violated the citizens' constitutional protections,” Salzman said in his acceptance speech. The event, held at the Unitarian Fellowship Hall in Bayside, was attended by dozens of members of the public and the ACLU chapter. For more information on the local chapter of the ACLU, visit redwoodaclu.blogspot.com.